Hipdf is an Online PDF Editor, Converter and more! Hipdf is an FREE Online PDF Editor, Converter and more! PDFs are undoubtedly the most widely used and accepted document format. Given their compatibility with different devices, it is generally easier to share documents in the PDF format. But the documents are never created in PDF format, we start with a different format and then convert our files to PDF. Having a proper set of tools before you start working with PDFs is a must. And in this post, we’ve covered a cloud-based tool that lets you manage your PDF files. Say ‘hello’ to Hipdf, an all in one cloud-based pdf solution. Hipdf offers a variety of features which are packed in a neat user-friendly interface. The tool makes even the most complex tasks easy to perform on a PDF file. The tool’s features have been discussed in detail as below. Format inter-conversion is the most basic and mandatory feature that every PDF tool should come with. Since PDFs are all about creating your documents and then converting them into pdf later. Hipdf offers a variety of conversion options for converting to and from PDF files. Most of the Microsoft Office Formats are supported including Word, PowerPoint, Excel. Apart from that, you can create a PDF file from some common image formats as well. Supported image formats are JPG, PNG, BMP, GIF, TXT. If this was not enough, the tool also supports creating PDF files from raw text files. So, this was all about from conversion. Talking about to conversion, Hipdf supports converting to almost all the formats mentioned above. 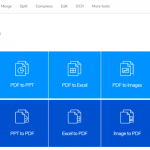 You can convert your pdf file to a docx, xlsx, pptx or an image format. Hipdf also supports OCR conversion, which means it can also handle scanned PDF files and convert them into editable formats. Compress feature comes handy when you want to upload PDF files somewhere, and they have a file limit. Compress not only makes your files compatible with such websites but also makes them email ready. Compressed PDFs take lesser time to upload and download which saves a lot of time. Once you’ve uploaded your uncompressed file, Hipdf lets you decide the compression level and corresponding quality of the PDF file. 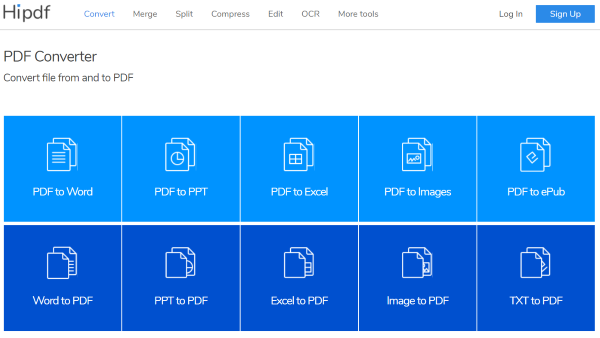 Merge and split is another offering by Hipdf that lets you merge different PDF files into one. You can upload all the files you want and then arrange them in the order you want. Similarly, for splitting a file, you enter the range of pages or split into ‘n’ equal parts. 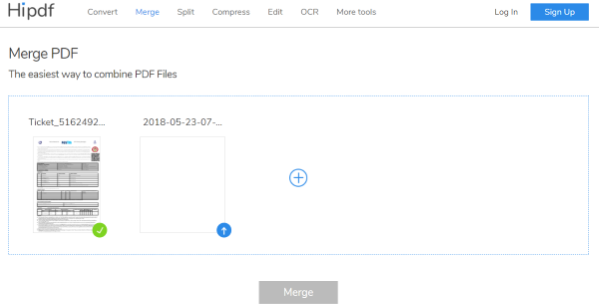 Merge and Split helps a lot when you want to distribute the size of a PDF into numerous smaller files. A smaller size is again favorable for uploading or attaching with emails. You must have seen some locked PDF files that require a password to view its content. You can implement same functionality on your files by using this feature. 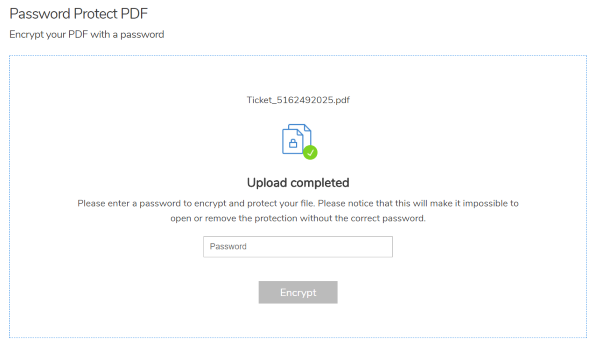 Protect lets you password protect your PDF files. All the protected files will prompt the recipient for a password before revealing its contents. Similarly, you can remove password protection from a file by using the Unlock feature. To remove passwords, you should know the correct password to unlock that file first. If all these features were not enough, Hipdf also comes with a minimal PDF editor. The editor lets you work with all sorts of PDF files and add text, image or shape overlays. The editor is suitable only for minimal things and is not in any way capable of complex tasks. Overall, Hipdf offers you a right set of tools for your daily PDF editing needs. The best part being, all of these tools are served from the cloud and does not require downloading or installing software. Click here to go to Hipdf.com. Convert JPG to PDF – https://samepdf.com/jpg-to-pdf – the online program helps to convert JPG files to PDF free of charge.